Not my usual M.O., but I decided to review the entire trilogy, not just the recently released third book. I re-read the first 2 because I realized when I started book 3, that it had been far too long since I'd thought about Kayla's story. Note: these books do not stand alone well. But, that's okay. But what if you say no? What if you don't want to become a code? For Kayla, this one choice changes everything. She becomes an outcast in her high school. Dangerous things happen to her family. There's no option but to run . . . for her life. Indivuality vs. conformity. . Identity vs. access. Freedom vs. control. The bar code tattoo. Debut near-future dystopian novel. Interesting premise, not so awesome writing. It's most certainly not Weyn's best work, but it is what got her some attention. There really wasn't a huge amount in this genre at the time and she did well breaking in with something different. I've read reviews that tell you the story is predictable. It's not. Well, it wasn't for when it was first published. Sure...it is now, when dystopian YA fiction is all the rage. The characters are all a little weak, and yes, Weyn has some disjointed connections here and there. But the book isn't a lost cause. The story doesn't wrap up neatly, which is a plus. You want some closure for Kayla and the love triangle she finds herself in while running from the government. So...you pick up the second book. Kayla has resisted getting the bar code tattoo, even though it's meant forfeiting any chance she'd had at having a normal life. Without the tattoo, she's an exile. But when someone very important sets about to bring her back in again -- WITH a tattoo -- Kayla finds herself a part of the resistence, where her unexpected allies and even more unexpected enemies include three clones of hers. Time and practice pays off for Weyn with this second installment. The story line line less haphazard and you're quickly pulled back in. The love triangle is a little less triangular and the characters are relate-able and like-able. You definitely want to root for Kayla and her friends, and not just because they are the obvious good guys in the story. Now, characterization is still running second to the story/ I'd still like more depth from anyone other than Kayla. In general, this book is faster and more thrilling than the first. There's more action and bigger climactic points. The year is 2025 and the mysterious, ubiquitous, and seemingly omnipotent multi-national corporation, Global 1, is in power through their agent President Loudon Waters. 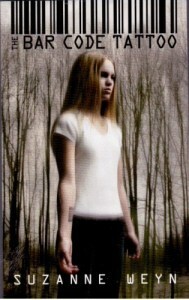 But now this ominous situation is experienced through the eyes of sixteen-year-old Grace Morrow. The final installment for this trilogy. It could stand-alone fairly well, because Kayla (you know..the main character for the other 2 books) isn't there. It's really good on its own. 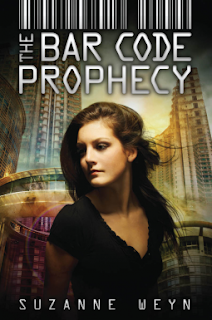 Yes, for an adult it's rather a stretch to buy that the Hopi Indians have prophecies about bar code tattoos, but it's not so out there for a YA reader--and since that's her target audience, well who cares what this adult thinks is a stretch, right? It does bother me that there's no wrap up or closure of Kayla's story line, and I'm bothered that, honestly, save for some details, Grace sort of felt like rehash of Kayla, with better writing and character development. Don't get me wrong, it's a good book on it's own, but it didn't complete the trilogy the way I would've liked. It felt like a companion book. Disclosure of Material Connection: I received the ebook galley for The Bar Code Prophecy from Scholastic Incorporated through the netGalley publisher/reader connection program. The Bar Code Tattoo and The Bar Code Rebellion are from my personal collection. I was not required to write a positive review. The opinions I have expressed are my own. Even with its faults, this one sounds like it would be good for my high school library. Do you think its worth buying?